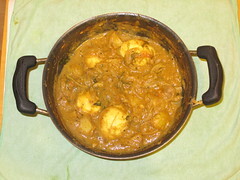 Potato egg kuruma .... my next recipe... It is masala based with coconut as the main ingredient. Eggs can be avoided if you are vegetarian.This kuruma can be served for breakfast and dinner . Boil the potatoes and eggs separately.Cut potatoes in cube shape . Make slender slashes on the egg vertically using a knife. Grind coconut,cinnamon,cloves,pottukadali and fried items to make a paste with little water. Heat oil in a pan and add mustard , wait till it splutters and add onion. Add garlic,curry leaves,coriander leaves and turmeric powder and fry till onion become transparent. Add little salt, so that onion cooks really fast. Add tomato and fry them well and add boiled potatoes. Now add grinded paste with one cup of water and boil well. Cook until the raw smell goes off. Add salt as required and add eggs and boil for few minutes. 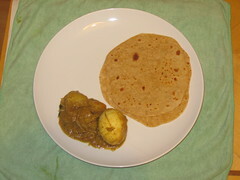 Add lime juice in kuruma before serving (Optional). This can be served with chappati, pulka, puri, idly, dosa. Try this and let me know your comments.